The Liberty Sweepy 1-5/16 in. Polished Chrome Round Knob features a stylish, modern design. With a polished chrome finish, this decorative knob can bring elegance and class to any decor. Mounting hardware included for easy installation. Polished chrome finish. Sharp cone look. Premium brass/zinc construction. Includes 0.75-inch truss head screw. Lifetime warranty. Easy to wipe & clean. Quality control approved in Canada. Re-inspected prior to shipping your order. The Amerock BP53717GPH Westerly 1-5/16in(33mm) LGTH Knob is finished in Graphite. Retro is revolutionized with an industrial twist on the classic urban lines of Westerly. Features sleek, modern lines and a substantial feel. Elegant, rich and warm, Graphite is the perfect alternative for those who love a dark, smooth finish but prefer a hint of grey. The Amerock BP53717G10 Westerly 1-5/16in(33mm) LGTH Knob is finished in Satin Nickel. Retro is revolutionized with an industrial twist on the classic urban lines of Westerly. Features sleek, modern lines and a substantial feel. The classic Satin Nickel finish provides a sleek, lightly brushed, warm grey metallic look. 1-1/4 Sweepy Knob, 1 per package The Liberty Sweepy 1-5/16 in. Polished Chrome Round Knob features a stylish, modern design. 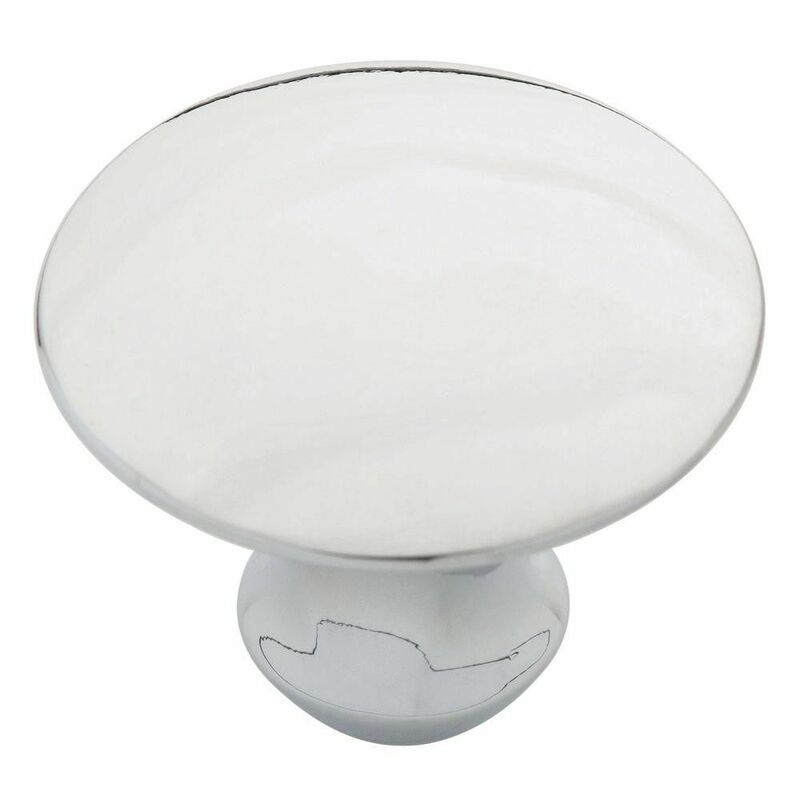 With a polished chrome finish, this decorative knob can bring elegance and class to any decor. Mounting hardware included for easy installation. 1-1/4 Sweepy Knob, 1 per package is rated 5.0 out of 5 by 7. Rated 5 out of 5 by Judy from Replaced white knobs with these and my bathroom looks great.... Replaced white knobs with these and my bathroom looks great. Rated 5 out of 5 by Wazir from The Barcelona soft brass cabinet knobs are gorgeous and amazing... The Barcelona soft brass cabinet knobs are gorgeous and amazing quality for the price. Too bad I had to return them because they did not go well with the colored cabinet that I was going to put them at. Rated 5 out of 5 by avjet from Excellent knobs for our cabinet doors. Excellent knobs for our cabinet doors. Rated 5 out of 5 by Javajunkie from Excellent, good looking, heavy, and stands out from cabinets so that folks with large or wide han... Excellent, good looking, heavy, and stands out from cabinets so that folks with large or wide hands can grip with ease! Well made and will probably out-last me! Touches of brass throughout my home and this is fine stuff that goes well! Rated 5 out of 5 by suestwocats from They're installed on my cabinets I ordered these cabinet pulls and another set, but these looked great. I returned the other set because they were too small and looked lost. These pulls add some glam to my new bathroom! Rated 5 out of 5 by kda338 from This product is very stylish and durable Knobs are heavy duty, while looking elegant. They really improve the appearance of our cabinets and drawers. Rated 5 out of 5 by kda338 from This product isgood quality This product is heavy duty and looks great. It really improved the appearance of our new cabinets.